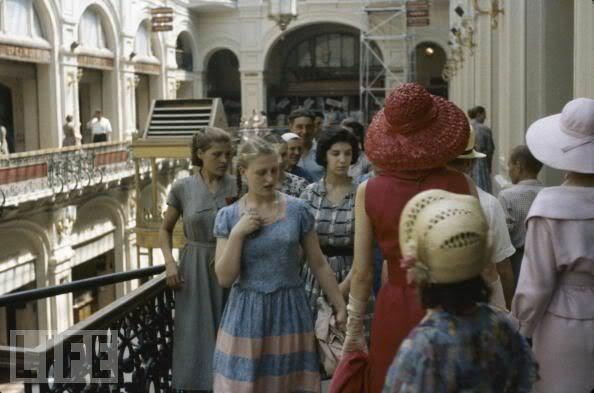 As I'm sewing my 1950's Violet Wiggle Dress it reminded me of the set of photographs I once saw on the LIFE archives. A few of you know I've been to Russia a few times, once when I was 15 with my very adventurous father (Russia was his type of vacation) and then after high school with the intent to study Russian History. To make a long story short I ended up being very homesick and my stay was brief. Still, it's one of my favorite places in the world and I've had the privilege to see. Since then I love learning about Russian history, the good and the bad, and seeing it through art and photography are one of my favorite things to do. 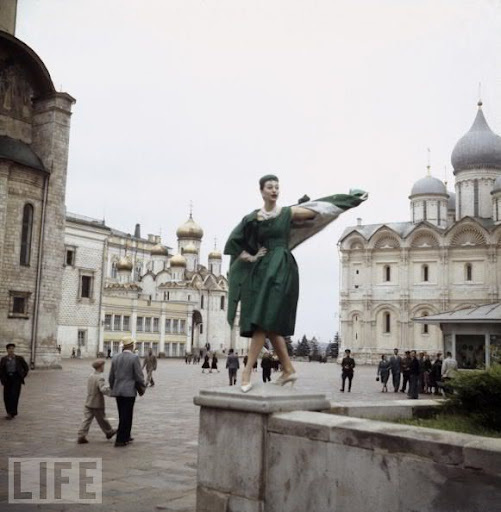 In 1959 the Soviet Union decided to get with the times and host some fashion shows. 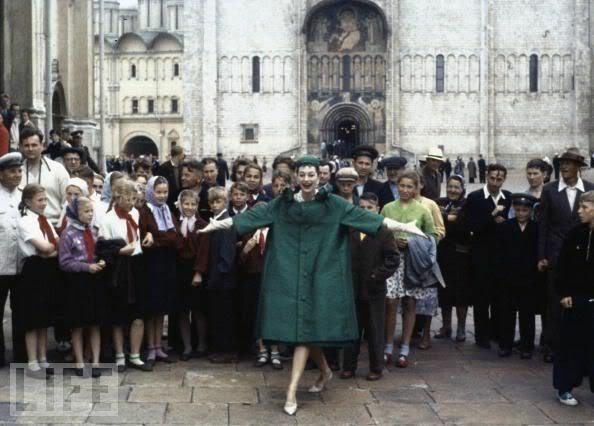 Does Yves Saint Laurent's Russian Collection ring a bell? Dior decided to bring their "New Look" straight to the people at GUM, which is like Russia's version of Galleria, located directly in Red Square. 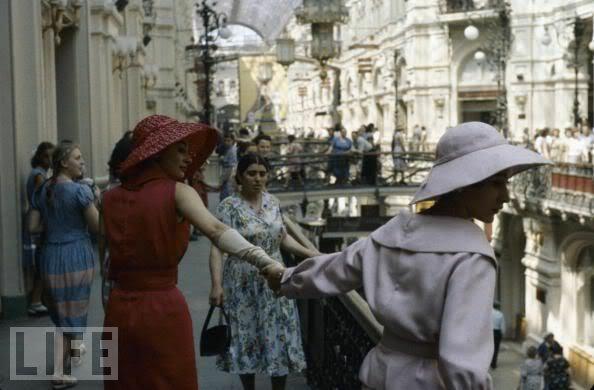 Back then it had more sensible shops for the working comrades, today it hosts over 200 luxury brands like Dior. Dior had it their mind just to walk with the people at GUM, who by their expressions seemed horrified and curious all at the same time. I'm kind of loving the floral dresses that nearly all of the women are wearing. 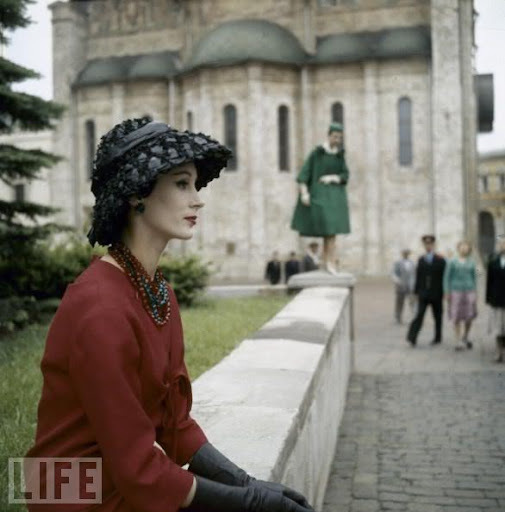 Kind of wish I stuck around Moscow for a few days more just to do some vintage shopping. Wait while I add it to my bucket list.